This is the story of a little bulletin board that grew. Creative folks like to call our boards ‘mood boards’ because that is where you stick bits and pieces of inspiration until the mood strikes up an idea. Living by the bay it was a natural that our board would take on a coastal mood. As a bric-a-brac collector it seemed to just grow and grow. 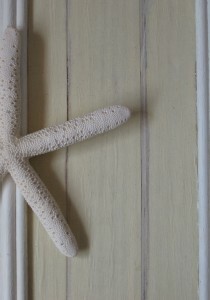 Natural textures are the theme for a real beach worn style. What do you think of a little faux panelling? Big lengths of wood are too heavy to mount on the wall and did a bit of creative painting instead. Working on faux leather masking tape got me to thinking, hmm with the right colours this could almost look like strips of wood. You can read more about my faux leather on Gaal Creative. And it is one of the few times when the cheapest tape gives the best result. I used Sello brand from the local dollar store, the trick is to find the lightest weight tape but in a wide width of 2 or 3 inches or 6cm+. It was really easy too. 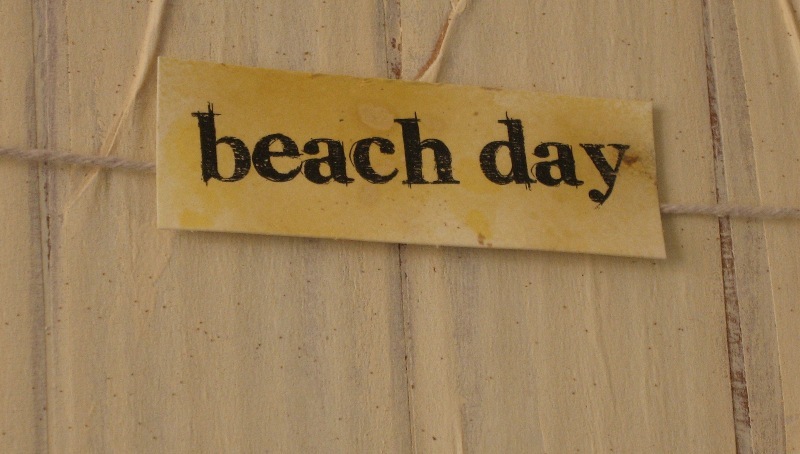 Simply cut cardboard to fit the inside of the frame and run the masking tape in long lengths up and down your ‘board’. It is ok if the tape is not completely flat or you get small wrinkles in the tape, this adds to the texture and authentic feel. 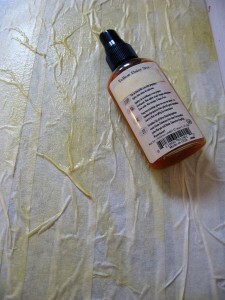 Leave a little gap .5 cm or 1/8inch between the tape to create groves and a bead board effect. Paint the grove between the tape with a glaze paint to create a resist, and you know I recommend Tattered Angels Sugar Cane or Cowboy. Before cleaning your brush, wipe it against the raised wrinkles and a couple of light brush strokes up the panel to add texture. When the dries it is time to paint your beadboard. Using multiple colours will help build up your faux wood effect. Randomly mist splashes of Yellow Daisy in places and before that can dry, wipe down the length of your panels letting the colour catch on raised edges. A broad sponge brush with a thin light coat of white or cream paint is next. Depending on the level of moisture in your paint and thinness of the tape you may already see bubbles lifting. Let that dry and add a second coat of paint. You will see bits of the darker glaze peeking through in the grove and variations of colour in the wood panels that give you a presto bingo there you go – faux wood panelling. The Tattered Angels design team is celebrating this month with a peek into our craft rooms follow the link to see what other creative projects are on show. Linked to Sarah’s BC Good Life Wednesdays and Jenny’s Alphabe-Thursday. Thank you Maya for featuring my mood board on Completely Coastal. oh wow, loving the faux panelling and decorations! thanks for sharing the tutorial.Happy Sunday! There is something about living near water that inspires one to use nature and items from our surroundings. Love this idea! What an absolutely lovely piece of work! Charming !<br />LoVe the cottage board background,<br />very clever ! 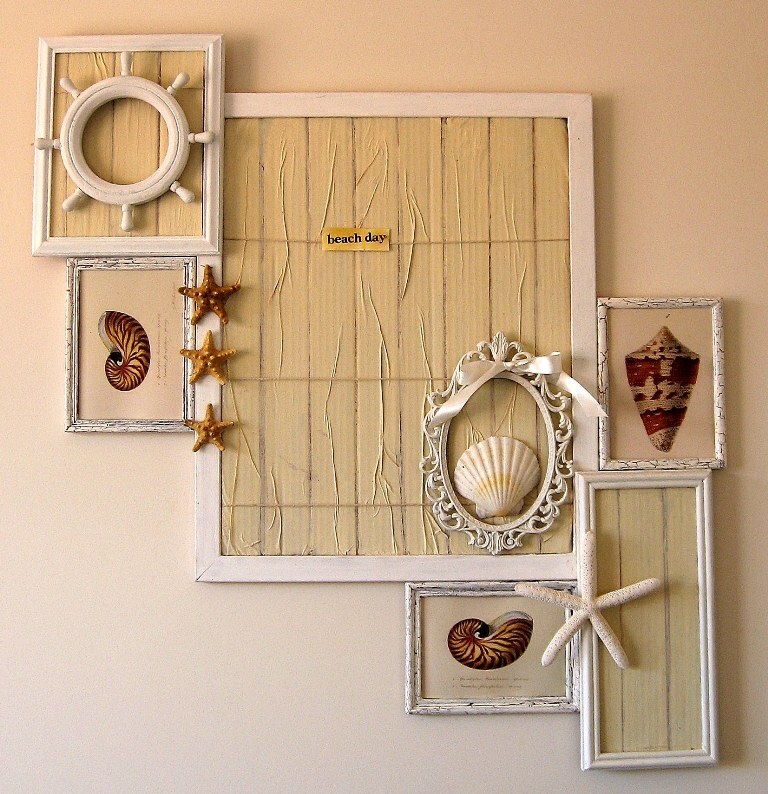 Very cool!<br /><br />I especially like how you used the smaller frames along the sides.<br /><br />I always see such neat smaller frames when I am out junking and wonder what to do with them…. love what you did here~beautiful work!!! I love your style and your creative talent! Thanks for sharing the details! 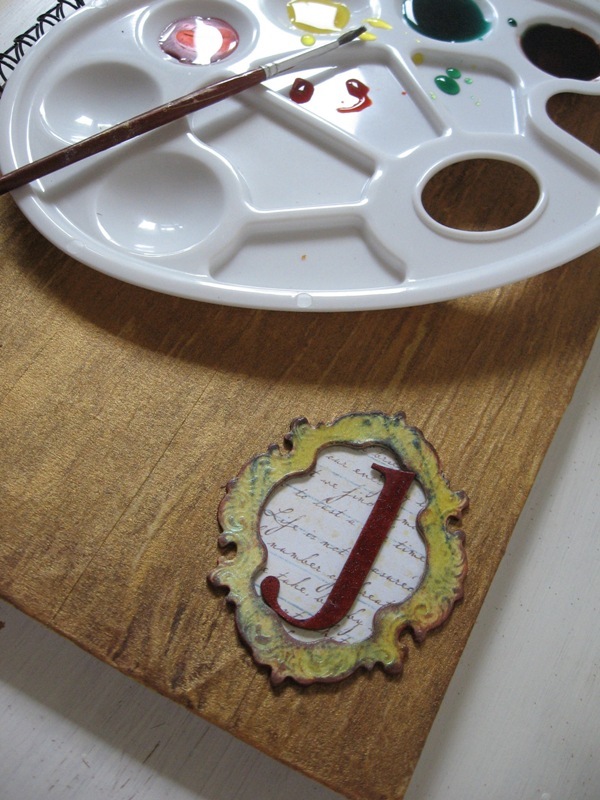 I saw your space on the TA Blog and wanted to know…how and what you use to keep your stencils on display?<br />I just love the idea! What a wonderful mood board! That is beautiful! 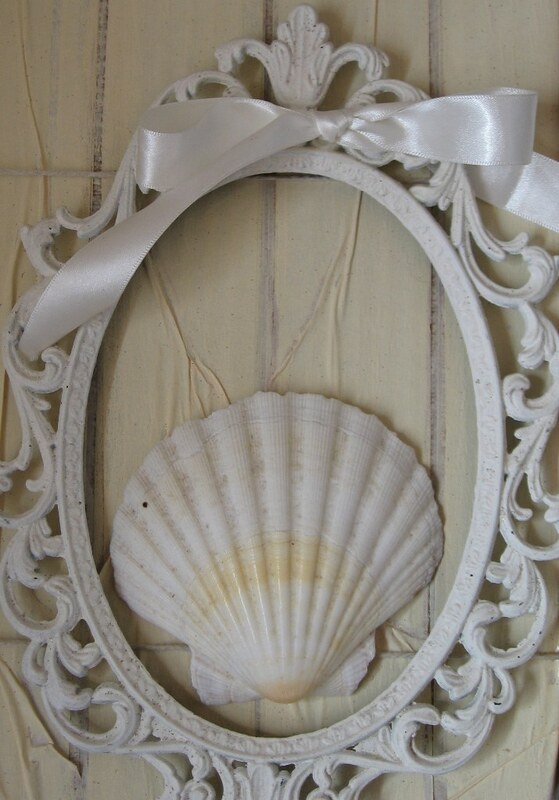 I love the shell prints! these look fantastic, nice job! wow,amazing work! Your blog is very pretty! !<br />Have a very nice day! love your mood board!! wish mine looked like that!!! Love this idea, never thought of a mood board as a work of art before! So COOL. What an incredible job and it&#39;s so UNIQUE!! I would call that &#39;art&#39; and I would call you a creative genius! Very creative. 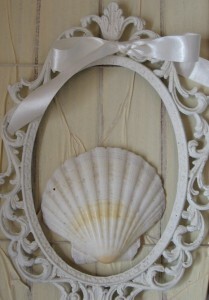 I love coastal decor. This makes me want to go to the beach. Very Cool Technique! Thanks for sharing! Oh dear, I guess it&#39;s time for me to head to the coast…I am missing the ocean! I can think of a lot of uses for this idea! Thanks!!! Leave a Reply to Tiff Click here to cancel reply.